It may surprise many people to learn that the first object that can reliably be called a photograph was created as long ago as 1826. It shows, in a very grainy image, a view from a window in which it is possible to make out a tree and other buildings (see above). It was the creation of Joseph Nicéphore Niépce, who can with some justification be described as the father of photography. Joseph Nicéphore Niépce was born in 1765 into a well-to-do family in eastern France. His father was a wealthy lawyer who was able to buy a large estate, the income from which allowed his sons to spend their time in scientific research. The family wealth caused problems when the French Revolution broke out in 1789 and wisdom dictated that the family abandon their estate. However, they were able to return to it in the post-Revolutionary period. Joseph and his older brother Claude were interested in two main projects, one of them being to develop an early version of the internal combustion engine, which was patented in 1807. This became Claude’s main priority, although he later went mad and died after spending far too much money on trying to develop it. The other project was photography, with the aim being to produce a permanent image. The principle of projecting an image on to a glass screen had long been known, with the “camera obscura” having been used by artists such as Johannes Vermeer to transfer an image to a screen that could then be traced over to form the basis of a painting. The invention of the camera obscura has been credited to Leonardo da Vinci. Experiments to capture such images were made by Thomas Wedgwood and Humphrey Davy, who presented a joint paper in 1802 that explained how they used silver nitrate to produce images on glass plates, but these faded rapidly when exposed to light. The challenge was to find a way of not only developing images but fixing them as well. Niépce solved this problem by coating a polished pewter plate with a bitumen-like substance. This was able to fix the image. 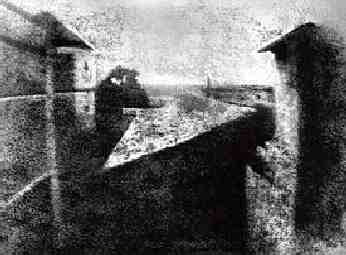 The famous 1826 image was made using a pinhole (i.e. lens-less) camera and allowing an exposure time of eight hours. Having made the breakthrough, one might have expected Niépce to go to town on publicising it. However, he was unwilling to do this, which would have meant disclosing all the details of his invention, until he could guarantee his financial returns. Although he was invited to present his work to the Royal Society in London, this restriction meant that the Society was unable to validate it. Instead, Niépce began work with Louis-Jacques Daguerre on making improvements to the design, and also on developing improvements to cameras. Unfortunately he was unable to see their joint efforts bear fruit because he died in 1833 at the age of 68, leaving Daguerre, who was 22 years younger, to carry on alone. It was therefore Daguerre who got full credit for a process that used copper plates coated with silver and which needed exposure times of minutes rather than hours. The “daguerreotype” process was announced in 1839, and this is generally regarded as the first truly practical photographic process, although it was fated to be superseded in its turn within twenty years. The role of Joseph Nicéphore Niépce was therefore that of pioneer. He laid the foundations for practical photography, but it would be left to others to provide the superstructure.